Some projects seem small and manageable until you start. You’re at the bottom of the hill looking up thinking, “Sure, I can totally do this.” So you start marching up that hill. It looks like you’re almost to the top but then another incline appears. “Oh god, not another step!” but then, glory, the tippy top of that hill appears. And hey, there’s a sunset happening so get ready bask in your achievement. Hello, I’m April and I just finished this sort of project. 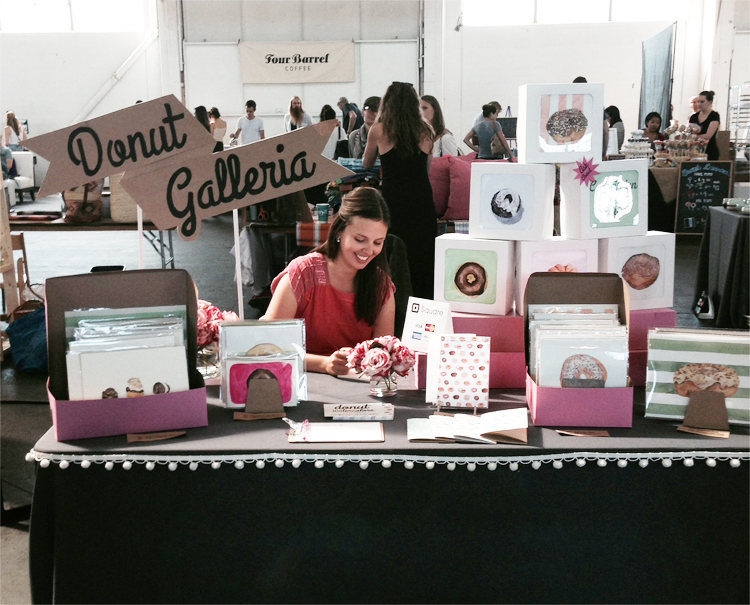 When I said yes to Brit + Co.’s Artisan Showcase at Re:Make 2013, I knew that I had a lot to do before my Donut Galleria was ready. And woah nelly, I split apart and reorganized my brain a few times in the process, but I did it. And now I can get ready for another event again without the fuss. Not only that but my Etsy shop is packed with prints and art. That tastes good, like a spoonful of ice cream after work. Would you like to know how I went about tackling such a project? Good, because I’m going to tell my story. In tomorrow’s Part 2, I’ll give bite-sized takeaways and some templates to help first-timers so that your hill isn’t quite so steep. But today? Today you get the madness behind my method. The first step is sometimes the hardest—how did I get started? After a bout of procrastination, I talked it over with my life coach and she challenged me to make a plan. It was two months beforehand so I had time to get it down on paper and suss out the details along the way. I started by organizing all the questions swimming in my head. How will I display the donuts? Do I have enough things to sell? What will the table look and feel like? What kind of signage should I use? 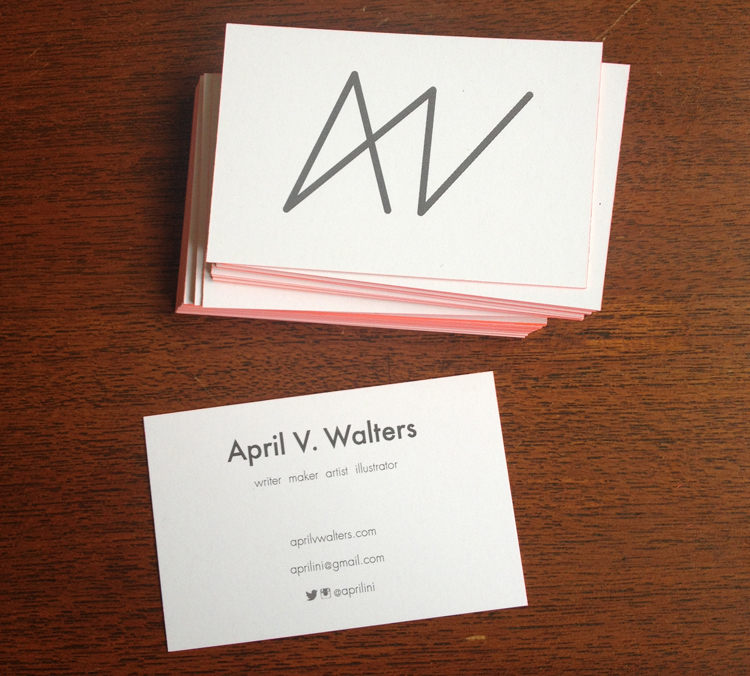 I need business cards! Or do I? What about some promotional materials? A newsletter? I kept writing down topics, questions, and concerns until several themes emerged. I grouped each thought under a general heading—event goals, products, the table, signage, packaging, and general operations. This rough outline became The Plan. What started as an unmanageable lump how had a definite shape. After I made The Plan, I drafted a hybrid checklist/timeline. This held the individual tasks that would need to be done in a logical order, whether or not I had a each concept developed. And I added dates, turning into a timeline, so that I had some structure relative to days remaining. Shout-out to my companions in perfectionism: My task completion tendencies lean toward perfectionist so it was helpful have my life coach challenge me to getting things 93% done. Isn’t that done enough? Things don’t have to be perfect for us to love you. Even with The Plan and Checklist living in a Google doc, I had a hard time feeling like I had much control with everything behind a screen. I needed some sort of method for breaking the main project into real bites. So one morning I started scribbling each thing that came to mind on a Post-it. After a minute I had a pile of Post-its. I then grouped and organized on a freestanding door in the hall. I also went through The Plan and made more Post-its to make sure I didn’t forget anything. Ahh, much better. Figuring out the main command center proved invaluable—my progress sped up, I stopped worrying, and had clear, decisive actions that needed my attention every day. I had a way to organize, move, and manage all the parts. I could see the progress! And I used color coding to indicate what needed to be done next, what was important, tasks that were blocked behind another task, and what was the lowest priority. I loved moving the finished Post-its off onto the wall next to the door. Those Post-its represented a great amount of work to me and it was encouraging to see how far I came even when it felt like I had a long way to go. After I teased out my business logistics and project organization, I moved on to the actual event prep. Specifically, I focused on the display and branding. This turned out to be a tangle that I had to gingerly pick apart one thread at a time. I not only did I need branding for the Donut Galleria, I also needed it for myself. I already decided that my brand keywords for my life, art, and in-general style: Snazzy, Charming, and a Bit Odd. 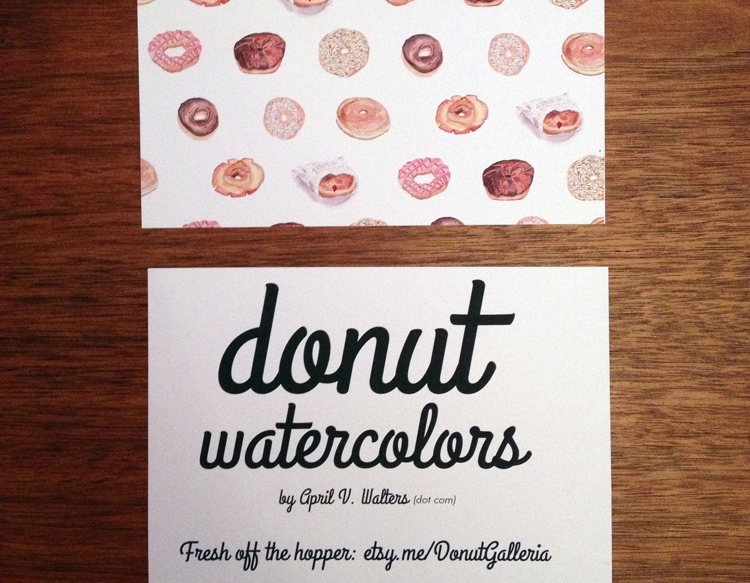 I wanted a business card specific to moi, because even though the donuts are a part of me, that’s not the only thing I do. My good friend Laura and I bounced ideas back and forth until there was a winning logo and biz card design. I moved to the Donut Galleria branding and signage. In a flash of inspiration, I imagined a simple postcard with some alluring language and a URL. I made a donut pattern for the front. But what to use for the font? I remembered seeing a list of fonts on a wedding blog so I cruised over and found Snippet and Ink’s 50 Free Fonts | Best Free Fonts for Wedding Invitations. I browsed the post, opened interesting fonts in new tab, and narrowed it down to six fonts. Exhilarated at the breakthrough, hit a decision making snag, and hung it up for the night. Once I had the print materials sorted, the next challenge was the display. I needed a table cloth. I farted away shopping online until there wasn’t enough time for shipping. Instead, I visited a fabric store the day before the event. Three important things happened here. One: there was a 40%-off sale. Two: I took a moment to look around and came across a selection of pom pom trim. And three: A clerk popped by while I was looking at cotton canvas and asked if I had any questions. I said, “Actually, yes.” My irritating pride and know-it-all self-sufficientness took a backseat and I asked the fellow for fabric that wound’t wrinkle. He dragged me away from the canvas (no, no, no, no) toward the polyester. There is a reason that every single restaurant and hotel tablecloth is made from this stuff! There were 10 colors to pick from and one jumped out at me immediately. Charcoal! Of course. And it looked great with the white pom pom trim. BINGO. Done, NEXT. 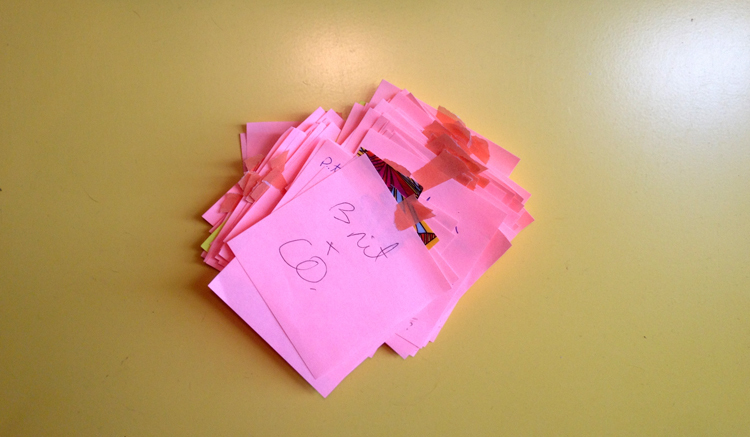 Newsletter design, price tags, a sign—finished Post-its covered the wall. I asked for and bought donut boxes from shops nearby, and made an inventory and finance spreadsheet. A trip to Michaels with a friend turned into a clever donut art display. I held a table dress rehearsal the day before the event. I could’ve cried because it looked so nice and so real. During the event I took down notes so that I’d have a record of what happened that day. It was wonderful to hear some of the comments, even from people who didn’t stop. 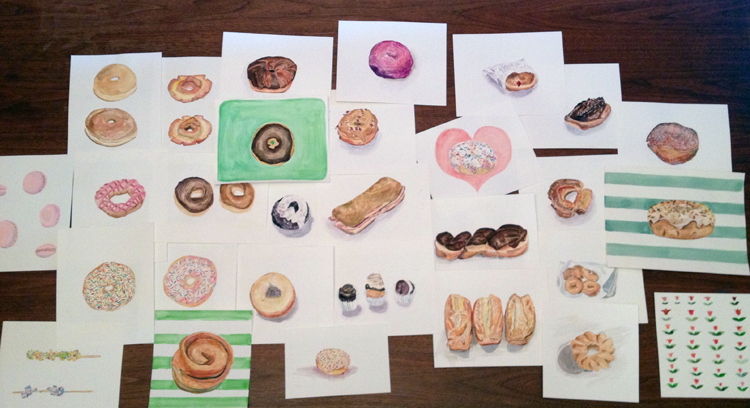 It turns out that donut art is niche, and hey, that’s ok. I know that people tend to be passionate about donuts or know someone who is passionate about donuts. I also took notes about what sold so that I’d have a record for my own inventory spreadsheet. One of the things I thought about while planning for this event was what my customer’s experience would be like. That was the inspiration for my postcards (big type, simple message), and also lead me to my favorite event idea. Imagine it—you’re shopping and see the person next to you pop a donut hole in their mouth. “Where did you get that? I want one!” I offered a free gift with purchase—three chubby donut holes in a french fry bag. Besides delighting people with a sugar surprise, it was a great way to meet other sellers. Everyone loves donut holes! I felt happy and proud to have been a part of Re:Make 2013 because it got my shop into shape and introduced me to a collection of great people. Because of the event, I’m now prepared to say YES at a moment’s notice for other events. In tomorrow’s Part 2, What I Learned, I’m offering up some nicely organized bullet points of tips and what I learned. I also put together a hopefully helpful worksheets for you when facing your first retail event. If you ever think you’ll sell something at an arts & craft event, come back and get a leg-up. Thanks for following along with my experience on this donut adventure. Posted in Personal Essay and tagged Brit+Co, craft fair, Donut Galleria, donuts, event, ReMake2013, watercolor.